I'm back at the National Peace Site near Sebastopol, California, having completed the trail loop through Ragle Ranch Regional Park. 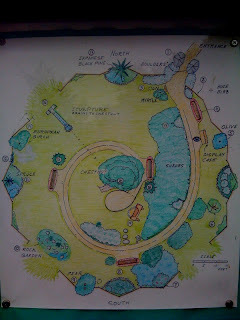 This photo shows a map of the Peace Site. There are some shortcuts in the labyrinth, but I walk the complete spiral of the path to remind myself that peace takes time and patience. I've posted the guide to the map below as two pages. The map and descriptive pages can be enlarged by clicking on the images. 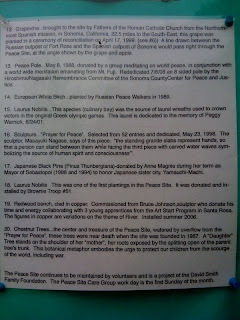 I was really fascinated to learn about this peace site and how many people from different places have contributed to it. In reading these descriptions, one becomes mindful that peacemakers are all over the planet, they are well connected, and well equipped. They have been in every generation. They were, they are, and they are to come. 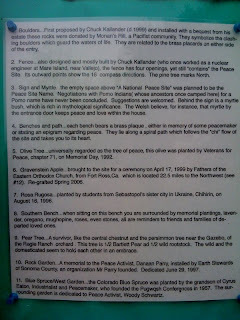 The attention to detail given in the description conveys the care that was given to the creation of this peace site. Photos. Photos from what I call a 54 Minute Peace Run are now available. A slideshow is below. Click here for more information about the 54 Minute Peace Run.